Once upon a time I knew a fellow named Jack Gor­don, and the other morning we renewed our friendship over breakfast. After surveying each other for a while, we agreed to issue a joint statement: "Neither of us has aged a bit." I said "once upon a time" because, over the past 39 or 40 years of my friendship with Jack Gordon, we have seen less and less of each other. That is because Jack now holds the rather unwieldy title of general manager and executive vice president of the Restaurant Association of the State of Washington. Guys with titles like that are, quite frankly, not much to write about. As head of the Restaurant Association for the past 23 years, Gordon has seen the number of eateries in his association increase from 300 to no fewer than 2,170. He directs a staff of 14 people. They do things, such as lobby for restaurants, hold educational seminars and deal with individual restaurant problems. None of that makes for lively column fodder. But no matter how routine his job may sound, nothing obscures the fact that Jack Gordon is one of the liveliest, funniest and most creative guys in this city. He is, bar none, the best banquet emcee around. He serves as boss of the International Restaurant Show, which attracted 27,000 people to the Kingdome last year. Back in the early 1950s, the U.S. 6th Army honored Jack with an Award of Merit for his role in greeting more than a million servicemen returning from the Korean War. He has headed festive ceremonies greeting U.S. presidents Eisenhower, Kennedy, Johnson, Ford and Carter; Queen Elizabeth and Prince Philip; Japanese Crown Prince (now Emperor) Akihito; the king and queen of Sweden; and presidents of the Republic of Iceland and West Germany. Working for Greater Seattle Inc., he created the Plaza of States at Seattle Center and headed up dozens of parades, civic events and special celebrations. Anyway, neither of us having aged so much as a single wrinkle since we first met, we fell to talking about some good old days. Like the time Gordon put on the last Gridiron Show for the old Seattle Press Club in 1952. "Now, a Gridiron Show is a lampoon," Gordon said, "and this year we put on what we called the Demopublican Convention. It was at the Norselander. We got Sen. Joe McCarthy for the Republicans and Alben Barkley for the Democrats. Well, Barkley couldn't show up, so we brought in Vic Meyers." McCarthy was, of course, the controversial communist hunter in those witch-happy days. As it happened, McCarthy showed up late, and as Gordon put it, "I made a big mistake that night - I left the bar open while we waited for McCarthy." McCarthy himself took on some liquid fuel when he arrived and the crowd was in a booing mood. "Somebody brought out a sign, 'Jumpin' Joe McCarthy,' and McCarthy roared, 'That's a communist sign!' and fistfights broke out all over the place. "Pretty soon the fighting erupted outside in the courtyard and somebody called the police." Gordon shook his head in remembrance. "Nobody got arrested, but that was the end of Gridiron Dinners in Seattle." Gordon's talents as a press agent were never more exemplified than when he worked for the Seattle University basketball team for what he now describes as "rosary beads and prayers." Very little dough; a labor of love. The Chiefs had, at that time, a set of perfectly matched twins, Johnny and Ed O'Brien. They were gifted, quick-witted and altogether colorful. But as a press agent, Gordon found it hard to get them national attention. What he did was a stroke of genius. He organized a flock of SU students, who ran a sort of volunteer clipping service. "After every game," he said, "we'd have these students gather all the clippings from local papers and mail them to sports editors and wire services across the country." It didn't hurt that the twins were actually quite good. 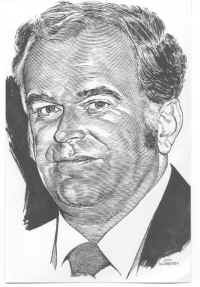 In fact, Johnny O'Brien became the first major college basketball player of' that time to score more than 1,000 points in a single season. He was named to the Associated Press All-American team. If you find that hard to believe, try this: Johnny O'Brien was only 5-feet-9; he played as a pivot man, a spot usually reserved for 6-feet-7 giants. "Anyway, two of our people went over and persuaded this kid to transfer from College of Idaho to Seattle U. He made us a powerhouse for two seasons and in his last year, he took SU to within one game of the NCAA title." If any young readers have come this far, I guess it's necessary to explain who this player was. His name was Elgin Baylor, who is now in the NBA Hall of Fame. He may well have been, as many experts still think, the greatest basketball player to ever play the game. 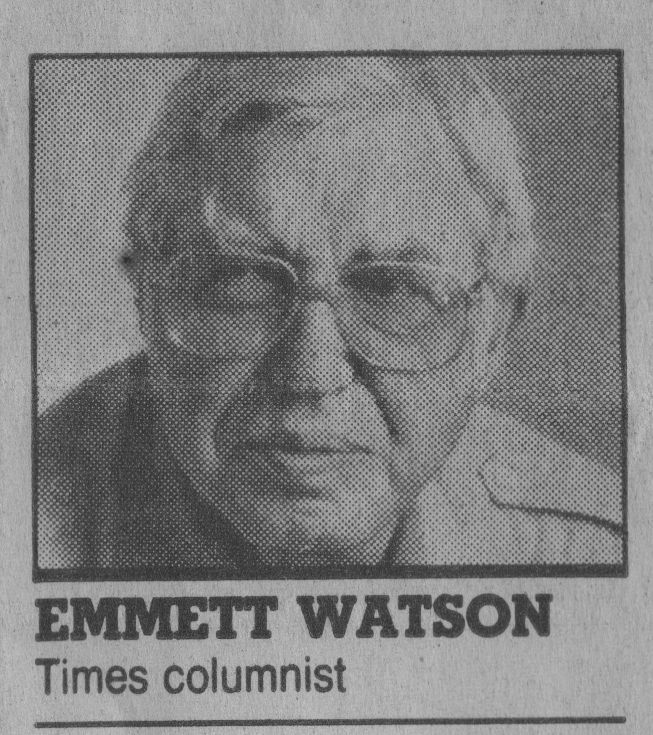 • Emmett Watson's column appears Sunday, Tuesday and Thursday in the Northwest section of The Times.